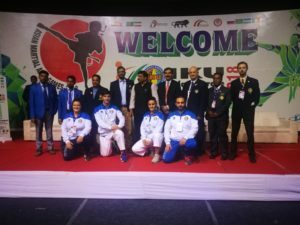 Monday 12 and Tuesday 13 November 2018, the beautiful Talkatora Stadium in New Delhi hosted the 2nd edition of the IKU Asian Championships. Excellent the organization of the competition in conjunction with the Asian Games of Martial Arts with Master BK. Bharat wonderful director; 350 karate athletes from 9 countries have created a sporting event that has also fortified the friendship between different peoples, there have been Russians (Siberians) alongside Nepaleses, Uzbeks with representatives from Bangladesh, and the Indian hosts who have fraternized with Italians, the invited “European” guests and finally Pakistani, Malaysian and Mongolian representatives. Many fights, even hard, many interstyle katas but also a lot of friendship and an infinity of photos among the many young people with a love in common; …IKU karate !!! 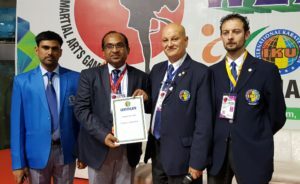 The international Chief Referee Sergio Valeri (Italy) held an interesting internship explaining to the 20 referees present the new competition rules; at the end, three Indian referees achieved the qualification of Continental Judges Ravinder Kumar Bharat, Ram Dayal P. , Sikandar Singh ed uno del Bangla Desh Abdullah Al Mamun . The President of IKU T.C. Dr. Stefano Pucci, has maintained diplomatic-sports relationships with the Indian Vice President of the Olympic Committee Mr. Karan Chautala and with the national television correspondent Mr. Manoj Verma; during the opening ceremony of the Championships he was sitting next to the Minister of Labor and Development of the Government S.E. Santosh Kumar Gangwar. The competition went on smooth and without accidents; discrete level in kata and very good competition in kumite with athletes really motivated. 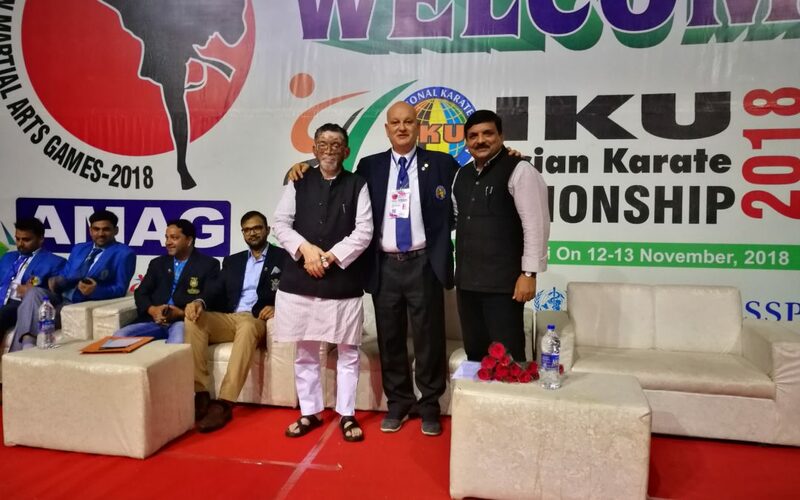 Of course, there will be something to be improved in the future but the perfect collaboration between the President of Indian Youthkarate-do Federation and member of the Board Mr. BK. Bharat and the President of IKU T.C. Mr. Stefano Pucci, is a guarantee for a stronger and stronger future of karate “made in IKU” … in the largest and most populous continent of the globe: Asia !!! !